The Hard-Light Bridge as it appears in Portal 2. These bridges are made from natural light that I pump in from the surface. If you rubbed your cheek on one, it would be like standing outside with the sun shining on your face. It would also set your hair on fire, so don't actually do it. A Hard-Light Bridge (simply known as a Light Bridge,) is a semi-translucent solid made from natural sunlight beamed in from the Earth's surface. It can act as a bridge for the player, a shield against turrets and other hazards, or even a wall for more complex puzzles the player encounters later on. 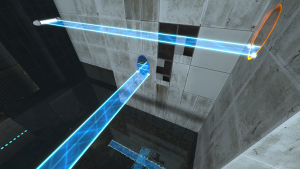 Light Bridges first appeared in the Flash Version MapPack and then in Portal: Still Alive, but were more formally introduced in Portal 2. The bridges span an infinite length or until stopped by another solid. Although the bridge is made of light, if one portion of the bridge is stopped by a solid object the rest will not continue as a beam of light normally would. Also, portals need to be in center with the bridge if trying to get it to another place, otherwise it won't pass through. Hard-Light Bridges can also be covered in Mobility Gels, allowing the player to use the gels in places where it normally would just fall through. Gels placed on Hard-Light Bridges are not permanent and disappears the moment the bridge dissipates or moves to a different location. The Hard Light Bridge as it appears in Chamberlock informational videos. This page was last modified on 11 November 2018, at 19:25.